Necessity of claim of title. Necessity of right of action. Interruption of running of statute. Exception in favor of the sovereign. Effect as vesting and divesting title. Trustee and cestui que trust. 2 R. P. - 46 not go.1 The last statute which adopted this method of fixing the period of limitation was St. Westminster I. e. 39,2 which forbade the seisin of an ancestor to be alleged in a writ of right prior to the beginning of the reign of Richard I. (A. P. 1189), and for other writs fixed the year 1217. 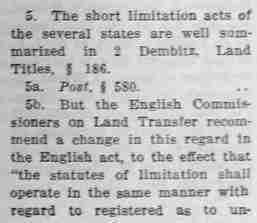 Thus, under this statute, at the time of its passage, the period of limitation for some writs was fifty-eight years, and this period was lengthened, as time went on without any change in the law, so that it exceeded three hundred years when, by 32 Hen. VIII. c. 2,3 a change was made, and the modern method was adopted of fixing a certain number of years within which the action must be brought. This last statute, however, applied only to the old real actions, and. 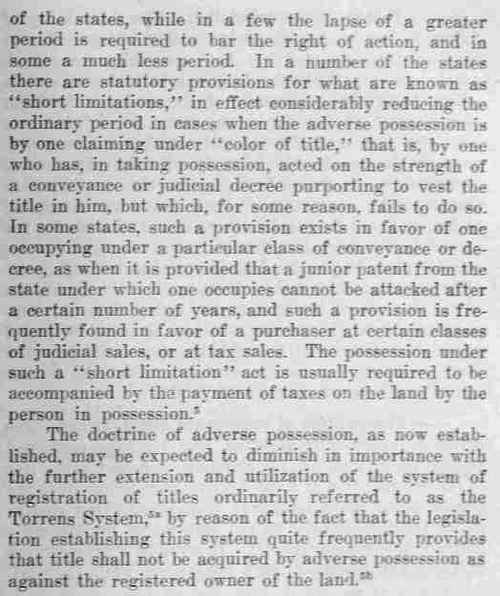 the action of ejectment having to a great extent taken their place, St. 21 Jac. I. c. 16, 4 was passed, which provided that no person should thereafter make any entry into any lands, tenements, or hereditaments but within twenty years next after his or their right or title shall have accrued. This statute, while not in terms applying to the action of ejectment, did so in effect by barring the right of entry on which the action depended. In this country the statutes of the different states, as regards the limitation of actions to recover land, exhibit very considerable diversity. but the courts, in applying them, have recognized certain general principles as governing the subject, with but little regard, for the most part, to the language of the particular statute. Pollock & Maitland. Hist. Eng. Law. 51, 81, 141. 2. 3 Edw. I. (A. D. 1275). 3. A. D. 1540. The disadvantages of the long period of limitation was, however, to a great extent avoided by the system of levying fines. See Lightwood, Possession of Land. 15C. - Presumption of conveyance distinguished. The doctrine, occasionally asserted, that the long continued possession of land by one claiming as owner gives rise to the presumption of a valid conveyance to him or to the person under whom he claims, though ordinarily similar in its practical results to the statutes of limitation, is entirely independent thereof. It involves a presumption of the rightfulness of one's possession, while the statapplication of the limitation statutes to laud registered under the system, the limitation period to begin to run, however, only after registration. Utes of limitation are by their terms applicable only when the possession is, apart from such statutes, wrongful. Haralson, J., in Lecro'x v. Malone, 157 Ala. 434, 47 So. 725; Depue, J., in Foulke v. Bond, 41 N. J. L. 527. A different view is indicated in Mclver v. Ragan, 2 Wheat, 25, approved in Craven v. Craven, 181 Ind. 553, 103 N. E. 333, 105 N. E. 41. 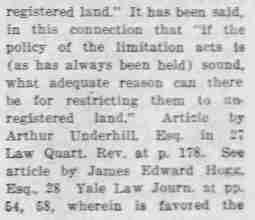 See the discussion of the policy of the statutes by Professor Henry W. Ballantine, 32 Harv. Law Rev. 135.